I love doughnuts but don’t like to buy a whole box of them because I know I will eat them all and I don’t want the calories. 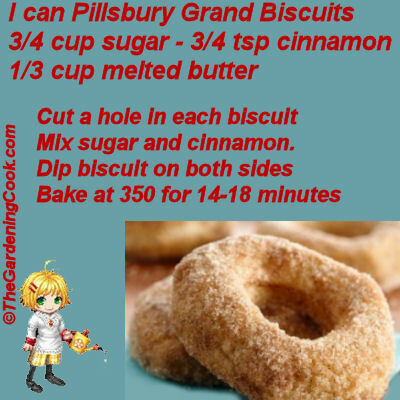 I came across this recipe for biscuit doughnuts on the Pillsbury site the other day and thought it would be a good way to make just a few at one time. I like them because I could make just a couple for breakfast and save the dough for later to make normal biscuits. The recipe could not be easier. Just open the can, cut a hole in the center of the biscuit. You can save the part you cut out and roll it to make doughnut holes!) Mix together the cinnamon and sugar. Dip the biscuit in the butter and then in the sugar mix and bake for 14-18 minutes at 350 F.